On March 23, 2006, STAR*D results were major news, front page in the Washington Post. STAR*D, the official acronym for Sequenced Treatment Alternatives to Relieve Depression, was a two-step antidepressant treatment study funded by the National Institute of Mental Health (NIMH), costing U.S. taxpayers $35 million. The NIMH proclaimed that STAR*D showed that “50 percent of people with depression can get better within the two treatment steps using this approach”; and STAR*D researchers declared, “A 50 percent remission rate is extraordinarily good, given the nature of these disorders.” The Associated Press and much of the media simply echoed the enthusiasm of NIMH and STAR*D researchers. For STAR*D, NIMH hired researchers with extensive financial ties to the pharmaceutical companies that manufacture the antidepressants that were studied. STAR*D’s scientific methodology was astonishingly substandard, especially its failure to include a placebo control group. In other antidepressant studies, patients treated with sugar-pill placebos have done as well or better than STAR*D results. Despite STAR*D’s additional level of drug treatment, if one takes into account depression’s known rate of spontaneous remission (remission of symptoms with no treatment at all), as well as STAR*D’s exclusion of patients less likely to have been cured by it, then STAR*D appears to have worked no better -- and conceivably, worse -- than no treatment at all. There were two levels -- or stages -- to STAR*D. In the first stage, all depressed patients received the antidepressant Celexa. In the second stage, Celexa-treated patients who failed to have remission of depression symptoms were assigned to several other treatment modes, including the substitution of Celexa with another antidepressant, either Effexor, Wellbutrin, or Zoloft; or Celexa was augmented with either Wellbutrin or Buspar (an antianxiety drug). The pharmaceutical companies that manufacture Celexa, Effexor, Wellbutrin, Zoloft, and Buspar were well-acquainted with STAR*D researchers. The two lead STAR*D investigators Dr. A. John Rush and Dr. Madhukar H. Trivedi receive consulting fees from or served on the advisory boards for Forest Pharmaceuticals (Celexa), Wyeth-Ayerst Laboratories (Effexor), and Bristol-Myers Squibb (Buspar); while Dr. Rush has such a relationship with GlaxoSmithKline (Wellbutrin) and Dr. Tiveldi has such a relationship with Pfizer (Zoloft); and Dr. Rush has an equity interest in Pfizer. Both have received speaker fees from Forest Pharmaceuticals; Dr. Rush has received speaker fees from GlaxoSmithKline; and Dr. Trivedi has received speaker fees from Wyeth-Ayerst Laboratories and Bristol-Myers Squibb. The drugs used in STAR*D were furnished at no cost by their manufacturers. In the first stage of STAR*D, 2876 depressed patients were given high doses of Celexa for 14 weeks, and 790 of them had remission of symptoms -- a success rate of 27.5 percent. The January 2006 American Journal of Psychiatry reports there was no placebo control in this study. This absence of a placebo control in a treatment effectiveness study is astonishing because it has long been known that sugar pills, other placebos, or any treatment -- including bloodletting -- are routinely reported by some patients as curing their depression. And so by the 1940s, a scientifically respectable investigation of a drug’s effectiveness required a placebo control to which the effects of the hypothesized therapeutic drug could be compared. Today it is well known in the scientific community from several other antidepressant studies that a placebo does as well or better than Celexa’s 27.5 percent success rate in STAR*D. An April 2002 Journal of American Medical Association (JAMA) study compared the effectiveness of the antidepressant Zoloft, the herb St. John’s wort, and a placebo in depressed patients. In the JAMA study, the placebo-treated patients had a 31.9 percent rate of remission of symptoms (Zoloft’s remission rate was 24.8 percent and St. John’s wort’s remission rate was 23.9 percent). NIMH and STAR*D researchers ignored the superior placebo remission rate in the JAMA study. Instead, NIMH and STAR*D researchers trumpeted the impressiveness of remission rates given how especially depressed the STAR*D patients were. However, the patients in the JAMA study were actually more depressed then those patients in the STAR*D study. The STAR*D and JAMA studies utilized the identical measure of depression, the Hamilton Rating Scale for Depression (HRSD-17), in which a score can range from 0 to 52, with higher scores indicating more depression symptoms. The criteria for inclusion in the JAMA study was score of 20 or higher, while in STAR*D it was only 14 or higher. (The criteria score for symptom remission was almost the same in both studies, 8 or less in JAMA, 7 or less in STAR*D). While the Celexa remission rate in the first stage of STAR*D study was highly disappointing compared to placebo results in other antidepressant studies, NIMH (which rounded up the Celexa 27.5 percent remission rate to “about a third”) described it as “particularly good results.” This would be like saying that the New York Knicks had “particularly good results” scoring 88 points while neglecting to say that their opponent scored 100 points, or, even more analogous, staging the basketball game without providing the Knicks an opponent. The second stage of STAR*D provided a second level of treatment for those depressed patients who failed to respond favorably to Celexa. It lasted 14 weeks and was reported in the March 23, 2006 New England Journal of Medicine. Among Celexa nonresponders, of those assigned another antidepressant, 21 percent had a remission of symptoms; of those who had their Celexa augmented with another drug, 30 percent had a remission of symptoms. As in stage one, there was no placebo control. And again, it is known from other antidepressant studies that had there had been a placebo control in stage two, the control would likely have done as well or better than STAR*D results. Beyond the lack of a placebo control, there are other reasons that NIMH’s enthusiasm about STAR*D is unjustified. NIMH neglects the well-known phenomenon of spontaneous remission -- the remission of symptoms without any treatment at all. According to a 1994 Canadian Task Force on Preventive Health Care report on depression, “Spontaneous remission can occur over 6 to 12 months in up to 50 percent of affected people.” NIMH’s enthusiasm that 50 percent of depressed people can get better within the two treatment steps in STAR*D neglects the well-known scientific fact that 50 percent of depressed people eventually get better in 6 to 12 months with no treatment at all – and the two stages of STAR*D took slightly over 6 months. It gets worse. Depressed people who likely would have been uncured by STAR*D were excluded from the STAR*D study. And it is conceivable that had the STAR*D subjects been sampled from the entire population, STAR*D result may have been worse than a 50 percent remission rate. One important group of excluded subjects was actually discussed in the NIMH press release, “For example, people were not eligible for the study if they had already been treated with an adequate dose for adequate period of time with one or more of the treatments that were part of the first two STAR*D treatment steps.” Thus, NIMH’s 50 percent remission rate is analogous to concluding, “A study shows that X antibiotic is effective for 50 percent of those with Y infection,” when in fact the researchers had excluded from the study all those whom had previously taken X antibiotic for Y infection but had been uncured by it. Unmentioned by NIMH is an even larger group of depressed people who did not participate in STAR*D and whose exclusion likely inflated the STAR*D remission rates. STAR*D subjects were selected from a pool of depressed people who had enough faith in medical care to seek it, and the research shows that one of the most important variables predicting the effectiveness of antidepressants is faith in the treatment. In a 2004 Journal of Clinical Psychiatry study on an experimental antidepressant, depressed patients who expected the antidepressant to be “very effective” had approximately three times higher rate of positive responses than those patients expecting it to be only “somewhat effective.” How large is that group of depressed Americans who STAR*D did not sample from because they do not have faith in medical treatment? According to the 1999 Surgeon General’s Report on Mental Health, “Nearly two-thirds of all people with a diagnosable mental disorder do not seek treatment”; and a 2000 poll showed that only 28 percent of American adults were willing to take antidepressants for depression for an extended period of time when pollsters informed them that safety studies on long-term use had not been conducted. It is likely that STAR*D treatment would have resulted in lower remission rates had it included depressed people who had little or no faith in antidepressant treatment -- no small group. In summary, (1) a placebo control, if it had been included, would have likely resulted in as good or better remission rates than the rate reported in either stage one or stage two of STAR*D; (2) in the time that it took to complete stage one and stage two of STAR*D, approximately 50 percent of depression patients had remission of their depression symptoms, which is the same percentage of depressed people who routinely have remission if they had received no treatment at all; and (3) the 50 percent remission rate trumpeted by NIMH is inflated because of the exclusion from STAR*D of depressed patients who would have been less likely to have had remissions with STAR*D treatment. However, the risk-benefit analysis of financial bottom line for pharmaceutical companies is another matter. Annual antidepressant sales are approximately $12 billion in the U.S. and $22 billion worldwide. Many Americans are unaware that drug studies reviewed by the FDA in their approval process are furnished to the FDA by the drug’s manufacturer; and pharmaceutical companies, historically, have loaded the dice in these studies to make their new antidepressants appear more effective than the drugs actually are. In addition to subject exclusions (called “cherry picking”), the outcome measurement is biased to weigh more heavily those symptoms that are affected by drugs and neglects symptoms of depression that are less affected by drugs; also sugar-pill placebos are used rather than placebos that create body sensations, this allowing subjects and researchers to more easily guess who has in fact received treatment (called “penetrating the double blind”). And drug companies sometime move into outright fraud. In 2004 New York State Attorney General Eliot Spitzer brought suit against GlaxoSmithKline alleging that it had engaged in repeated and persistent fraud with respect to Paxil. As part of the settlement, Glaxo agreed to pay a fine. Spitzer had evidence that Glaxo had suppressed the results of studies on children and adolescents which showed Paxil to be ineffective and to increase the risk of suicidal thinking and behavior. While the FDA’s trust of flawed and fraudulent pharmaceutical company data has long been a problem, NIMH’s STAR*D study is a kind of “boot on the face” for Americans. In STAR*D, U.S. taxpayers paid for a methodologically substandard study done by drug-company connected researchers, who drew unjustifiably positive conclusions about antidepressants. Why did NIMH allow itself to be used as, essentially, a promotional tool by the pharmaceutical industry (Big Pharma)? Similar to other powerful industries, Big Pharma has created a revolving door of employment with government agencies, and it is not unusual for higher-ups leaving NIMH to become affiliated with pharmaceutical companies. Examples of the NIMH-Big Pharma revolving door include Steven Paul, a scientific director of NIMH, leaving in 1993 to become vice president of Eli Lilly (manufacturer of Prozac, Zyprexa and other psychiatric drugs); and Lewis Judd, a former NIMH director, who in 2001 joined the scientific advisory board of Roche Pharmaceutical (manufacturer of Valium, Klonopin, and other psychiatric drugs). NIMH’s bastardization of science is a problem not simply for people who care about mental health. When word gets out that a major scientific institution is not doing science, then all scientific institutions become suspect, and this has many societal implications. The discrediting of scientific institutions, for example, helps fossil-fuel dependent industries obfuscate the fact that real science does show that global warming is a genuine phenomenon. And the loss of authority of scientific institutions aids the cause of the religious fundamentalists who deny evolution and demand that intelligent design be taught in public schools. Historically, the loss of truth and reason is a good thing for autocracy and it is a bad thing for democracy. 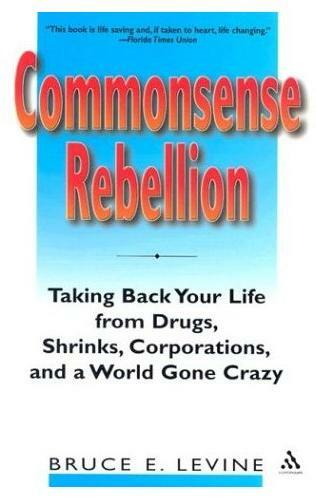 Bruce E. Levine is a clinical psychologist and author of Commonsense Rebellion: Taking Back Your Life from Drugs, Shrinks, Corporations, and a World Gone Crazy (Continuum).